The BestDomainPlace.com affiliate program may be the ONLY remaining domain name registrar affiliate program that pays commissions ongoing for the LIFE of the customer. Meaning, as long as your customer buys a domain name through your domain name affiliate program storefront, and renews year after year, you will continue receiving annual commissions on that domain name renewal year after year! Since a storefront is provided, along with 24/7 support for YOU as the affiliate, there is a small annual administration fee to cover those charges. In our experience, domain name affiliates need an average of just ten customers to break even on the expense. After that the rest of the commissions are dollars in your pocket! Why is Ongoing Commissions Important? With other domain name affiliate programs, you might make a little money by suggesting to your friends, family and clients to register their domain names. But, you will only get one commission payment for your referral. Ongoing commissions allow your revenue to steadily build over time and are ONLY available through the system attached to Best Domain Place. When we first began our domain name affiliate program in 2003, we were actively giving workshops to groups of 30-150 in attendance. In every workshop, we would recommend BestDomainPlace.com for domain name registration. Sure, we got commissions on sales along the way. But, where the real money started to happen was when the renewals came around the next year! We were bringing in new sales + commissions were coming in on customer domain name renewals. 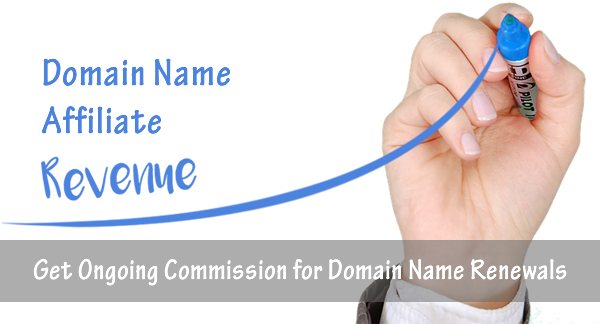 Every year since as been a steady increase in domain name commissions because of renewals. What is the Average Customer Value? The Average customer buys 3 items; average commission percentage is 10%. Average commission payout per customer is $31 per year. So, you would only need two to five (ten at most) customers to justify paying the annual BASIC affiliate administration fee of $79.99. What Domain Name Referral Options are Available? We offer two levels of domain name affiliate programs: The Basic and Pro. The Basic domain name affiliate level provides you with a turnkey storefront. If you click the “Search for a Domain” button on the home page at BestDomainPlace.com you will see the storefront provided. We installed a WordPress website on the front end of what the affiliate program provides so that we could further customize the look and feel. Get Ongoing Commissions – Year after year, as long as the client continues to renew, you will get commission on renewed sales as well as initial sales for new customers for ALL products in the system including domain names, SSL certificates, website hosting, email hosting. Turnkey Storefront – No HTML or shopping cart build-out knowledge needed. Simply login to your private account and upload a logo image. Credit Card Transactions – No merchant account needed. You can start selling domain names, hosting, email, SSL certificates and more…in minutes! SSL/HTTPS Ready – No need to buy a static IP address or annual SSL certificate for your storefront because your account is already SSL certified and PCI Compliant. Save Money – Enjoy up to 20% discounts on domain names and other products you can purchase through your own affiliate site! Support Staff Provided – 24/7 Support is provided for you and your customers free of charge. Brand Consistency – Support staff answers the phone with whatever product name, service name or company name YOU provide in the system. The Pro domain name affiliate program is a great option for those who have professional services providers for clients. If your clients are website designers, social networking agencies, website hosting companies, virtual assistants, SEOs, or search marketing advertising agencies, book authors, speakers, consultants, or coaches, their clients will be asking them for a reputable source to register their domain names. You will be providing them with a valuable referral source by recommending they start their own BASIC RESELLER account through your PRO RESELLER storefront. When they do, you get commission for the initial reseller sign-up AND a small residual income from every product (domains, hosting, SSL, etc) sold through their store front. That’s right! It’s a 2-tier affiliate payment system! The biggest reason for the $179.99 annual charge over the $79.99 Basic is because the Pro version gives you BOTH turnkey storefronts; one for you to sell domain names and get ongoing commission through your own domain/hosting storefront and a second storefront to inspire new resellers into the system under your account. You also get specialized support help for working with your affiliate storefront. Get Ongoing “2nd-Tier” Commissions – You get commission for the payment your referral makes to be a part of the domain name affiliate program AND a small, 2nd tier, commission on sales made by that affiliate. The sales numbers definitely get interesting when you get 15 or 20 affiliates promoting their affiliate storefront to new customers! Get Affiliate Recruiting Store Front – Our Turnkey storefront for registering new affiliates is BestResellerProgram.com. Get 24/7 Support – Domain name affiliates need different support than normal domain name technicians can supply. You will have access to a special phone number to bypass normal customer support to talk to affiliate support staff when you need them.